Currently we have a beautiful litter of f3b mediums 35-45 lbs. available and ready to their very own homes on 6/8/18. These guys are smart, curious, playful, loving and social and will be ready for any active home environment. Goldendoodles are wonderful companions and love to travel. 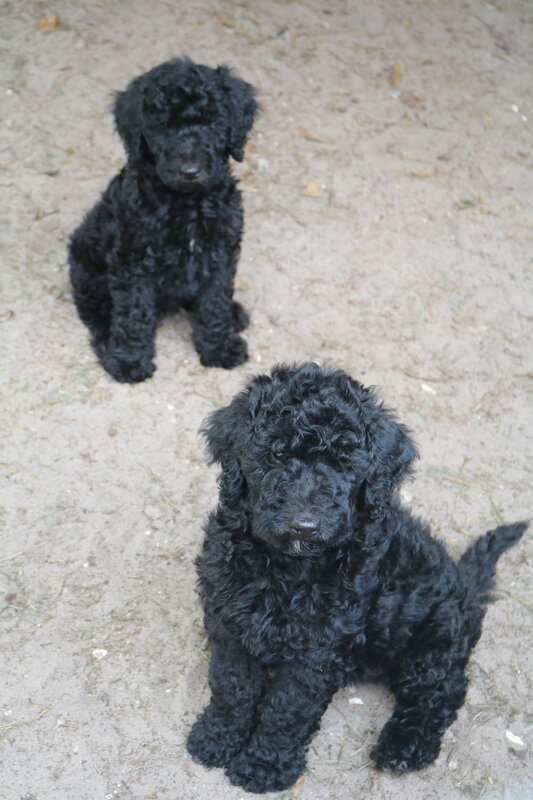 Please check knudawn.com (available puppy page, parents page and buy a puppy page) for more info including pricing, health info and more or please call Dawn at 941-889-9236 to chat or schedule a visit. We love visits. 3 FULL YEAR COMPLETE HEALTH GUARANTEE AND FORMAL PERSONALITY TESTED. Parents are fully health tested and we mean fully. Everything that can be tested for is test and copies are provided to you. A list of all testing done is on knudawn.com. Check out our buy a puppy page for full details. THESE GUYS ARE FULL ATTENTION SEEKERS AND LOVE TO BE LOVED ON. THESE ARE VERY LOW TO NO HAIR LOSS AND NO DANDER. LIFETIME BREEDER SUPPORT IS ALWAYS INCLUDED. BREED AND RAISED BY PROFESSIONALS IN THE PET CARE INDUSTRY. MY EDUCATION IS IN ANIMAL BEHAVIOR, ANIMAL SCIENCE, BUSINESS COMMUNICATION AND BUSINESS MANAGEMENT. I AM A GROOMER BY TRADE WITH OVER 20 YEARS OF PET CARE EXPERIENCE STARTING WITH OWNING A BOARDING, GROOMING AND DAYCARE FACILITY AND BEGINNING MY BREEDING PROGRAM WITH STANDARD POODLES FOR THE FIRST 10 YEARS THEN MERGING TO JUST BEING FULL TIME GOLDENDOODLE BREEDER WORKING WITH SERVICE AND THERAPY AGENCIES WORKING TO PRODUCE HIGH QUALITY, HEALTHY, GOLDENDOODLES THAT ARE CALM, LAID BACK, WELL BEHAVED, SOCIAL, FRIENDLY, FAMILY ORIENTED PETS. MANY OF WHICH HAVE BECOME TRAINED FOR SPECIFIC SERVICE WORK, THERAPY DOGS, EMOTIONAL SUPPORT DOGS AND WORKING WITH P.T.S.D. PATIENTS. I'm always available so just call or text (emails take the longest to get back to) . I am Located just east of Port Charlotte, Florida. We can ship international via air (delta preferred) or you can pick up locally, ground delivery in the east coast region or meet at just about any of the Florida airports to meet you so you can return home with your baby in tow.